JOHANNESBURG — International conservationists in Madagascar have been treating more than 10,000 critically endangered radiated tortoises that were seized from traffickers who crammed the creatures into a home with no access to food or water. The Turtle Survival Alliance and other groups are caring for the tortoises at a wildlife facility in the Ifaty region of the Indian Ocean nation, although hundreds have died from illness and dehydration. The alliance says police found the radiated tortoises at a home in Toliara on April 10. The group said the amphibians native to southern Madagascar likely had been collected for the illegal pet trade, with Asia possibly the intended market. Radiated tortoises are coveted for the star pattern on their shells. Most of the surviving tortoises appear "fairly healthy," said Susie Bartlett, a veterinarian with the Wildlife Conservation Society based at the Bronx Zoo. In an email, Bartlett described the challenges of working with the huge number of tortoises. 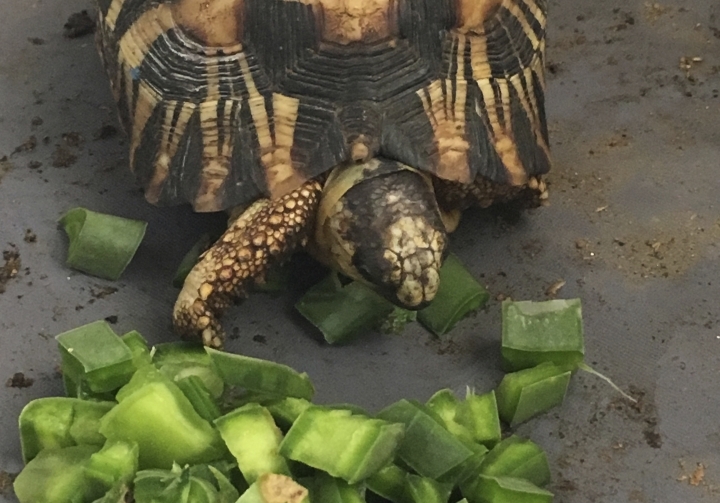 Each morning, "ill tortoises that are under veterinary care are collected from their enclosures and brought to the clinic in large tubs and pans," Bartlett wrote. "Sick animals are given subcutaneous fluids to rehydrate them and antibiotics if needed, along with vitamin supplementation. This is easily done with the sick tortoises that do not have much strength to retract their heads and legs." However, as tortoises get stronger it gets more difficult to extend a leg out of a shell to find a fold of skin for an injection, according to Bartlett. Some of the rescued animals have eye and mouth infections and are given pain medicine. Conservationists from zoos in the United States — the Bronx Zoo, Zoo Knoxville in Tennessee, Hogle Zoo in Utah, Dallas Zoo and Oklahoma City Zoo — are participating in the rescue. About 1,500 radiated tortoises deemed to be healthy have been moved to other facilities in Madagascar. Radiated tortoises used to be found along roadways in the dry, spiny forests of south and southwest Madagascar. Poaching and habitat loss have taken a heavy toll, according to a "red list" of threatened species compiled by the International Union for Conservation of Nature. The list says Asian smugglers are known to collect the tortoises and that tortoise meat is popular among some people in Madagascar.